Ekadasa; Labha (profit and gain); Aya (income or all kind of receipts); Agamana (acquisition); Apti (Gain); Prapti; Kama (Desire, passion); Siddhi (Fulfillment); Vibhava (wealth or riches); Slaghyata (commendation, veneration); Sarasa (anything juicy or succulent). 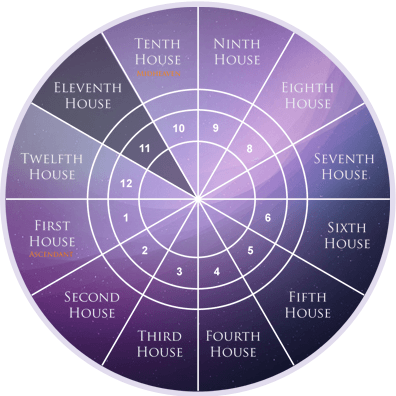 Eleventh House represents means of gains, accomplishment, friends, personality, ornaments, elder brother and freedom from misery and pain. It mainly concerns on one’s hopes, wishes, aspirations and their realization. It represents gain from profession or business, higher studies or foreign collaboration, election, litigation, speculation, writings, health etc. Eleventh House is also known as “Labha Sthana” representing profit or gain. Hence if we put houses from 1 to 10 together, we get the overall income from different sources. Let’s suppose a specific amount is our gross income and when we deduct expenses caused by Twelfth House, we get net payment or net income. 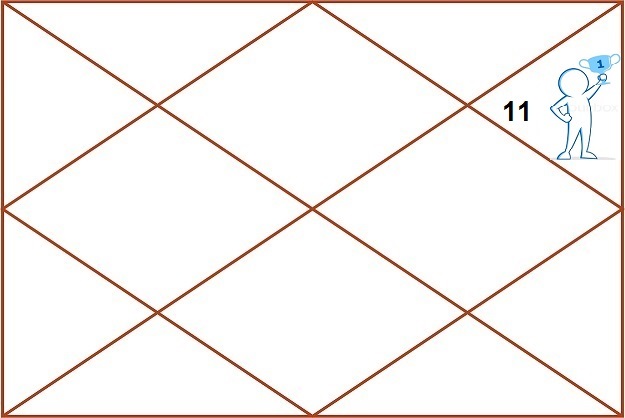 The sign which governs this house in Kaal Purush Kundali is “Aquarius” and the natural ruler is “Saturn”. The author of “Jataka Desh Marga” expresses his views on Eleventh House that attainment of efforts, desire and absence of misery are to be predicted through the 11th house. Bhattotpala ascribes elephant riding, horse riding (elephants, horses and conveyances), clothing, crops, jewels, wisdom and wealth to 11th bhava and says that one should guess every information about these from it. Realisation of one’s wishes and desires, acquisition of wealth, profit in every undertaking, varieties of income, one’s influence, dependency, eldest brother, paternal uncle, undesirable nature (if afflicted), worship of deities, virtuous devotion towards God, respect to elders, gain of knowledge, high level of intelligence, welfare of the employer, loss of interest on one’s capital, possession of costly metals, ornaments, etc., advising others, luck, easy gains, brother-in-law, mother’s longevity, left ear, knee, attractive, painting and arts, sarasa, hearing some pleasing and delightful music or happy news, ministership, dawn of fortune and longevity. It represents prosperity, profit, progress in attempts, peace after achievement of aspirations, partnership and permanent tie of friendship. If you lent money to others then principal amount and interest are ruled by the 11th house. On the other side, if you borrow money from others, then 5th house rules over debt and also tells about the person from whom money has been borrowed. The lover is judged by the Eleventh House more accurately as it tells about the emotional attachments one will possess. This house represents how long the friendship and intimacy will last and may end up with marriage. As per things concerning marriage, one must look for 2nd, 7th and 11th houses in order to get an idea about successful marriage. It represents success in social and financial related matters. It also relates to the reformative and unconventional activities. 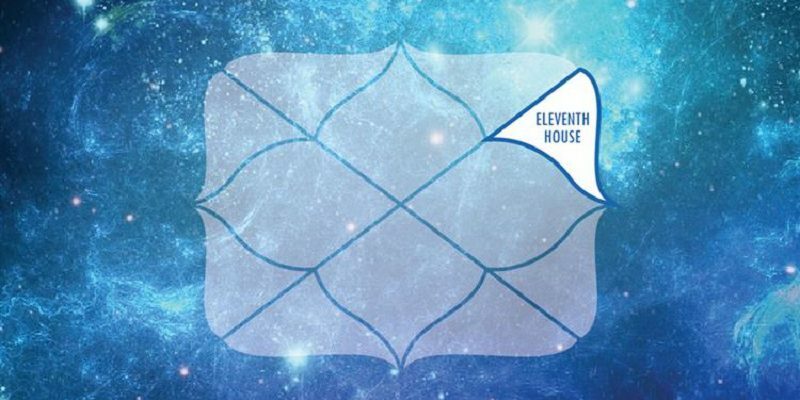 One of the influential astrology houses, Eleventh House indicates the “Trust”. It also refers to financial matters or wealth of the employer or those who have the command over to the native. Physically, it represents the left ear, right foot, left hand and two shanks. Vaidyanatha Dikshitar suggests that one should look after the 11th bhava to find out the accumulation of incoming wealth. Varahamihira refers to this house as “Aya” denoting one’s income. He says that 11th house is one of the improving houses or upachaya sthanas. According to Sarvartha Chintamani, if Eleventh House or lord of Eleventh House is in Shubh Kartari, then it will provide enough wealth to the native. Mantreshwar calls this house as the House of Siddhi and Prapti. In Mundane Astrology, Eleventh House represents parliament, legislation, state legislators, state, town, country, national treasuries, currency printing, department of govt. It rules the Lok Sabha, lower houses of state assemblies, Corporations, Municipal Bodies, District Boards, Panchayats and similar legislative bodies. It represents ambassadors, Vice Presidents of the countries, Advisory groups, state-level governing bodies, national aims and goals, national plans, friends of nation, enterprises, clubs, gambling resorts, followers, fellowship, projects, cooperative societies, termination of legacies, public celebrations, supporters, friendly organizations, environmental control, alliances, will of people, gains from other nations. In Horary Astrology, this house is connected with the hopes, desires, wishes and fulfilment of an individual. In market forecasting, this house is considered for government loans electric companies, gas, museum etc. In horse racing, it denotes the management of the committee under the control of the stewards. The number of winners is shown by this house. Other significations of this house can be correlated with other houses of the horoscope. It is the house of gains and represents our children as well. Our children are also our future investment. We need someone to take care of ourselves. We hope that our children will provide us proficient gains. This house represents the people who support you or your circle. A bad person can also get the reward or prize, a reward is something which is given to the person for his deeds. Bad people can also get rewards as per their good deeds, hence Eleventh House represents gains. It also represents gold, the fame of your karmas, a large organisation, house of committee etc. It represents the income from one’s own exertions, paternal aunts and uncle, short journeys and messages from father, loss of mental tranquillity, legal education, testators, secret and occult knowledge, wife or husband’s affairs and their business investment profits, enemies of enemies, sickness of servants, debt of tenants, marriage or married spouse of son, legacies from mother, foreign journeys of brothers, family reputation and standing, destruction of enemies, end of losses and regain of health. It deals with the fame and reputation of your family lineage, religious and spiritual beliefs of your neighbours; death, rebirth and transformation of your mother. It shows the occult and mystical beliefs of your mother. Spouse of your children, exotic animals, UN, NGOs, victory over enemies, children, goal, karmas of 8th house, karmic storage of 8th house, ego and style of your father, professional network circle etc. 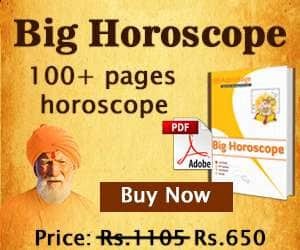 As per Lal Kitab, Eleventh House in Astrology represents your earnings, neighbours or judge, gains, court, a seat of justice. The planets occupying third house activate the planets occupying this house. The planets in the Eleventh House will affect the native positively or negatively during its period of time. As far as the Dasha will end, these planets will have adverse effects on the native. Hence the Eleventh House of the horoscope becomes very important as it determines the gains from your karma or activity. The kind of response you’re getting from others based on your karma evaluates your successful reputation in the society as per the Eleventh House of the horoscope.